FairStars CD Ripper 1.50 free download. FairStars CD Ripper is a powerful software for ripping audio CD tracks to WMA, MP3, OGG, VQF, FLAC, APE and WAV formats files on-the-fly. Free CDDB is supported(Querying & Submiting).FairStars CD Ripper is a software that helps you to ripp CD tracks. It supports normalization when ripping, and also support ID3 tag. FairStars CD Ripper also supports playback with its built-in player. FairStars Audio Converter is a useful and professinal conversion tools for converting WAV,APE,OGG,MP1,MP2,MP3,WMA,WMV,ASF to WMA,MP3,OGG,APE,WAV formats. ImTOO CD Ripper is a useful and flexible tool which is used to extract CD tracks to MP3, WAV, WMA, OGG Vorbis, VQF, or APE with ease. Live CD Ripper is an audio CD ripping application. 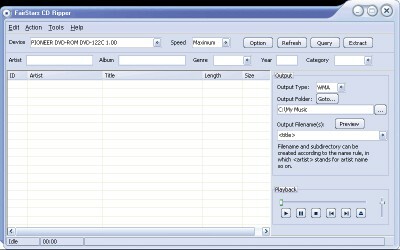 Speed CD Ripper is a flexible tool used to extract CD tracks to MP3, WAV, WMA, OGG Vorbis with ease.